customised experience that’s underpinned by excellence. We have been leaders in flooring for over 20 years and never rest on our laurels – we are always staying up-to-date with the latest quality techniques and trends. In this section, we discuss laminate as a popular, hardworking, value-for-money floor covering option. What is it and why go for laminate flooring in Pietermaritzburg? This is a covering made of pressed wood. The top layer resembles wood, but it is not wood. It is also not vinyl – the two are made from different materials. When we advise on the option to go for laminate flooring in Pietermaritzburg, many clients are astounded to learn that the laminate is not in fact wood – and that the top is made up of photo-quality images of real wood. Even if you stare at it very closely, it is hard to believe! This realistic look is achieved by using two thing sheets for the surface layer. Both are saturated with melamine. Melamine is a thermostatic, high-pressure resin. These layers are then covered by a tough but transparent layer. The result is a ‘floor’ that’s able to handle high heels, dog fur, dust, and occasional damp. It is not ideal for places that may be saturated with wet, such as the bathroom. If you go for laminate flooring in Pietermaritzburg, it can withstand the high humidity levels. Easy to install and fit. Laminate floorings are made primarily from wood and wood derivatives – the middle layers, not the top layer. The derivatives include wood fibre and pulp extracted from wood, such as paper. Wood, being a sustainable and renewable raw material, makes laminate flooring a product that’s light on infringing precious resources. Even the actual manufacturing process is environmentally friendly. And the benefits to the environment don’t end there. Thanks to new processes, laminate flooring can be recycled at the end of the product lifetime. When laminate is dismantled as boards, most of the floor can be put back into the production cycle. In fact, the ground boards can be used in agriculture and horticulture as a growing medium. 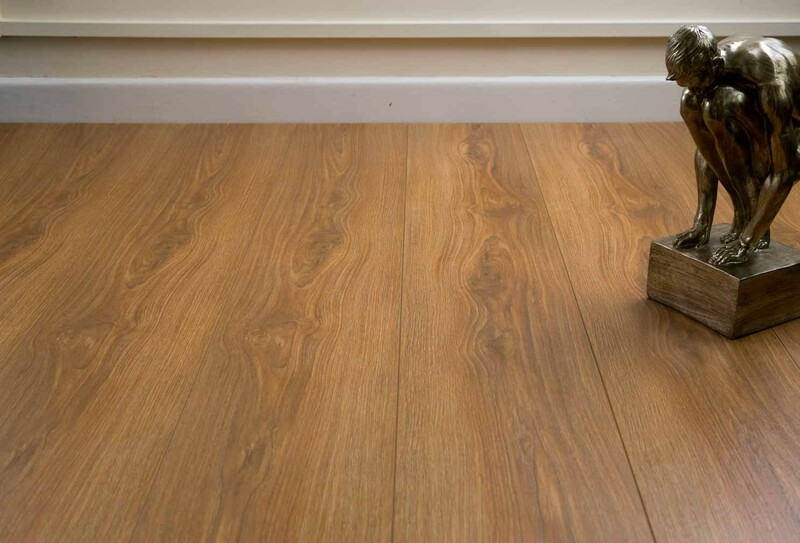 Disposing of laminate flooring is a safe and cost-effective process. This product is designed to protect rather than destroy the environment. So if you’re looking for local cost-effective, sustainable flooring options, consider laminate flooring in Pretoria. Laminate flooring has a sealed surface, which ensures that dust and dirt simply can’t penetrate or cling stubbornly. This makes it a hygienic option and kind to allergy sufferers – no more mites or mould! Your health and baby crawling on the floor will thank you. For those worried about the impact on their health when choosing laminate flooring in Pietermaritzburg, we can confidently tell you that this is one of the best options. If you constantly wheeze or have asthma thanks to the humid conditions, this floor option definitely won’t aggravate it. Because laminate is largely stain-resistant, you’ll also save on detergents and harmful floor chemicals. That’s good news for the environment and great news for your pocket! Simply sweep the dust away regularly. Use a broom, damp cloth or vacuum cleaner and the floor will be good as new in no time. Laminate floorings are made up of a number of layers. As mentioned earlier, there is a top décor layer comprising a transparent, wear resistant contact surface. In the middle is a core layer made of high density wood fibre. The last layer is a stabilising layer to provide floor stability. These are sometimes complemented by further layers, for example, an underlay for footstep sound reduction. The surface of a laminate floor can be printed with any design conceivable. It gives the floor its individual appearance. Everything is possible, thanks to cutting-edge, modern printing processes. Not only can you change the 2-D appearance, you can also alter its 3-D properties by creating tactile surface textures. This is an entirely routine process that lends the floor a natural appearance and creates its tactile properties and textures. Laminate flooring continues to gain in appeal – both aesthetically and for its value-to-payment outlay ratio. When we advise on laminate flooring in Pietermaritzburg, we always emphasise that few other kinds of flooring can compete with how easy laminate is to maintain, and also its durability. Because it can come in so many designs and textures, it is by no means a standard or staid option. If you’re a creative homemaker, you’ll derive much joy from this ground finish and be the proud owner of a wonderfully welcoming aesthetic to boot. The majority of European laminate flooring manufacturers have combined under one umbrella trade association. This was done so as to better provide effective assistance to prospective customers, sales staff and fitters in making the right choice given that there is such a broad range of products. Since its establishment in 1994, the EPLF has worked tirelessly for quality and transparency in the European laminate flooring market. The creation of the EN 13329 European Standard of laminate flooring originated as an EPLF initiative, which sought to set a quality framework standard for laminate floors. When considering laminate flooring in Pietermaritzburg, you can also rest assured that it conforms to the highest global quality expectations. CELQ Certified European Laminate Quality is a European quality mark for laminate floorings. It vouches for the first-rate quality of the product. A list of certification numbers for laminate floorings which have been awarded the CELQ mark is available. The certification number is displayed on the CELQ quality label, which is then displayed on the laminate flooring packaging. Consumers should always look for this mark when purchasing flooring.